Posting early and in haste. The photograph wasn't in haste, however. Isn't it a beauty? Cousin Claire said I MUST go to the Conservatory Gardens while the weather was still good. I try to please, and so last Wednesday after a visit to my podiatrist, noticing how good it felt to walk without pain, I decided to nip on up. I was at 54th and Lex and I took the No. 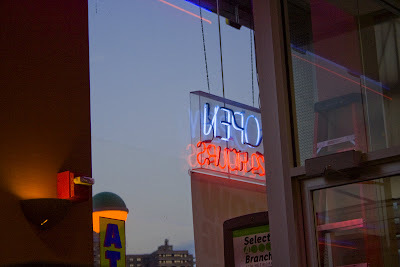 6 train up to 110th Street to get a short photowalk in. Lexington Avenue up here does not have the charm it has farther downtown. 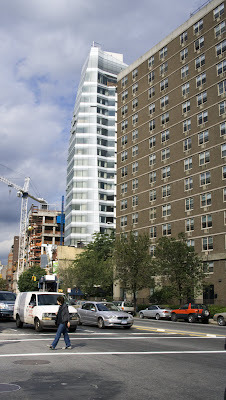 The avenue seems wider and is flanked by big blank apartment houses. This was the first interesting spot I came to. And here's a closeup of the menu in the window. Notice the only English word on this menu is Lunch. Uh, words, I mean, like Lunch Special. Chocolate. Tea. Oh, never mind. 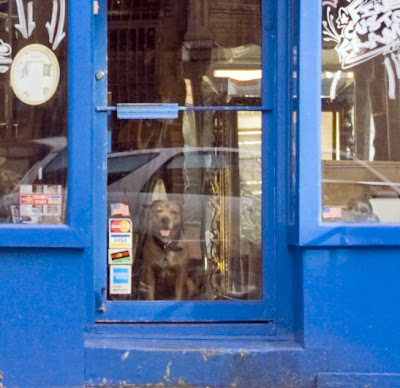 And here is Blue through the window of McDonald's. McDonald's! 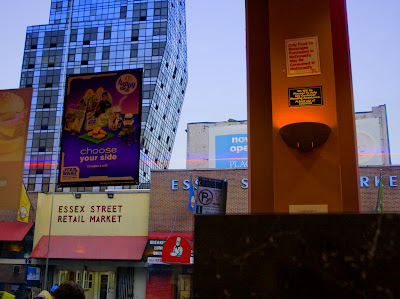 Of all the places on the Lower East Side we might have stopped at, why did we pick McDonald's, you are wondering. Well, at just the moment when we both realized we were tired and wanted a cup of coffee and a bathroom, there it was. We didn't argue. So we were sitting there discussing Egg McMuffins and whether they did them better at the diner at the train station in Washington, D.C., when I revealed that I had never had a Big Mac. No sooner did I offer that news than we realized that now was the time. And so it was that I went to the Lower East Side and had a Big Mac. And so did Luka (not her first). It wasn't bad. In fact, it was kind of good in a bad sort of way. And I came to understand that a Big Mac is not a hamburger. That is why they call them Big Macs. Once that is clear, it can be appreciated for its own bad self. So ended our 9/11 commemoration. Photo Note: I admit I increased the saturation on the above photo. I don't usually do that, but this time, it was irresistible. Apologies for this late posting. No politics today, it was computer trouble. I'm showing you this first shot to set the scene. 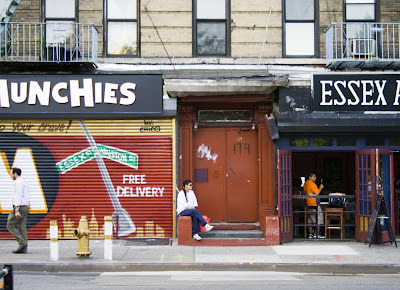 This is the corner of Essex and Rivington. 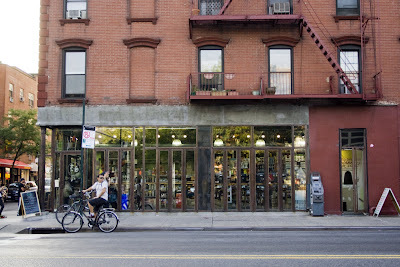 Easy to believe we're on the Lower East Side, yes? 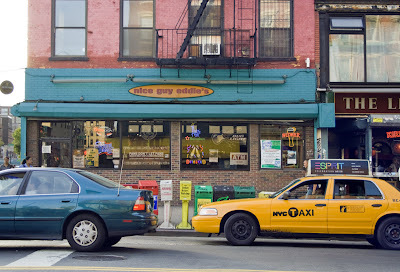 Same corner (note Visco sign), different angle. And what's this big blue thing looming in the sky? It's actually one block over on Norfolk Street and the name of it is Blue. I remember reading about this building but I had forgotten – and to come upon it unexpectedly is quite a delightful shock. I'm not saying I actually like the building, but I like looking at it. 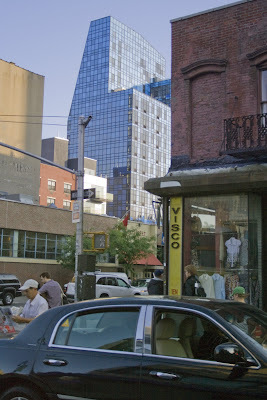 NYC Architecture calls the style Deconstructivist. 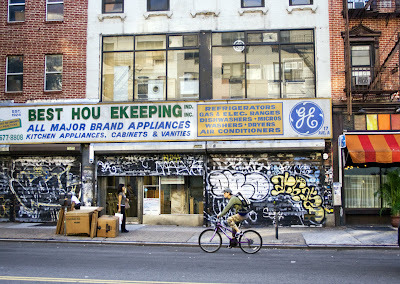 The Lower East Side is changing. But I bet you already knew that, didn't you? 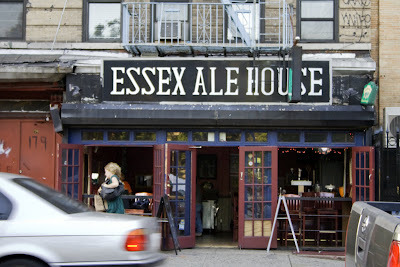 The Essex Ale House serves no liquor, only a good selection of foreign and domestic beer. And wine. But you probably shouldn't go there to drink wine. They also serve no food, but the bartender will order out for you. It is described approvingly on the web as a dive. Looks good to me with those French doors open to the street. We are in an entirely new neighborhood and I'd like to write an essay on it, but I am just exhausted with politics. What a week, capped by the debate tonight. I thought Obama did very well, but I was disappointed that McCain didn't really mess up. After his strange behavior of the past couple of weeks, I thought there was a good chance of it, but not this time. Well, there's always the Vice-Presidential debate next week. 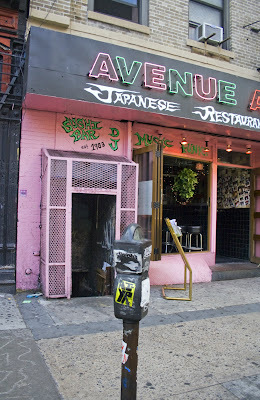 Anyway, I'll try to pull myself together and have something to say about the Lower East Side tomorrow. Maybe I should just go cold turkey on politics. 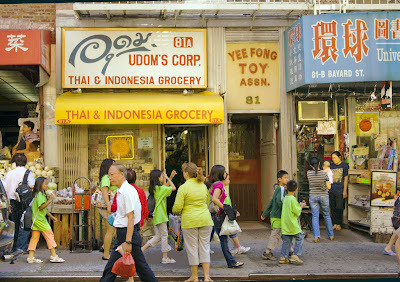 I photographed this pretty store from across the street, never guessing it was a grocery store, E&S Wholesome Foods. A grocery store with floor to ceiling windows? Why isn't it a restaurant? Anyway, one of its owners is a guy who grew up in the neighborhood when it was drug riddled and dangerous. Read his story here. 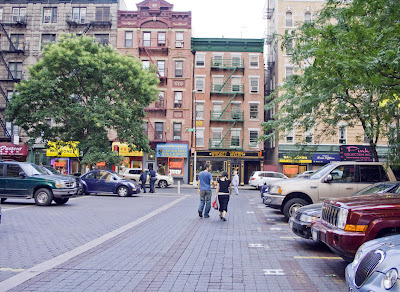 And so, skipping over a few blocks, we come to the last block of our East Village walk, just before crossing into the Lower East Side. The most you could say about the Best Hou keeping sign is that it seems misplaced. In fact, Nice Guy Eddie could probably teach GE a thing or two about housekeeping. 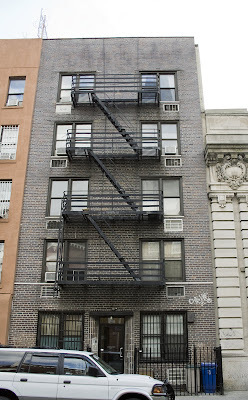 Here we are, as promised at Luka's first apartment house in New York. 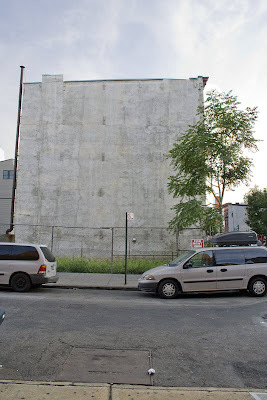 Possibly the most boring building of the entire blog. She went on to better things. Right next door is the unused former Public Bath, bringing a little architectural class to the block. But how about a little color? Okay, here's some. 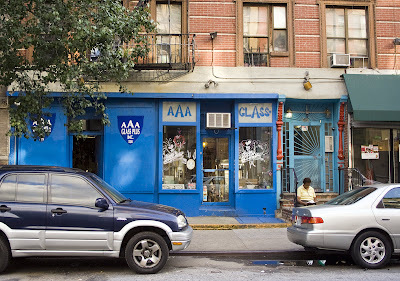 This is AAA Glass Plus. When I enlarged this photo, look what I found. 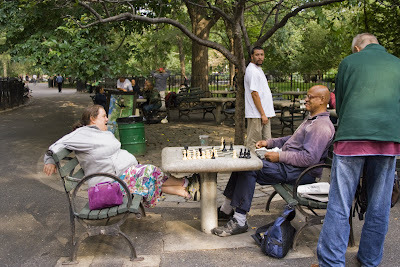 This is the entrance to Tompkins Square Park, and if I read this correctly, this lady is a couple of moves away from a checkmate and is leaning back, enjoying the situation. Unless I'm wrong. 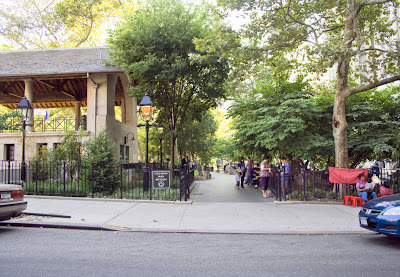 The link above is the official City Parks link, but you may prefer this New York Times article, which is about a walk taken in the East Village with Clayton Patterson, apparently a well-known documentarian of this area. If you have no time to be following links, just know that this park hosts the Howl Festival, during which Wigstock has appeared, but not this year, and the Charlie Parker Jazz Festival. Keep these in mind for next year; they've come and gone this year. The two-week deadline is looming, so I'm going to have to ditch some photos. But first, this street scene with truck. 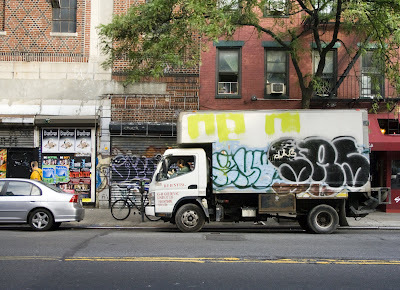 You didn't think I'd do the whole East Village walk without a truck shot, did you? Although I consider myself a pretty brave eater, it's possible my standards for sushi are a little finicky. Funky is not what I'm after. But if you're young and fearless, you may agree with these reviewers. Among other things, they like the DJ and the sake bombs. Sometimes you just have to put a photo up and leave it at that. 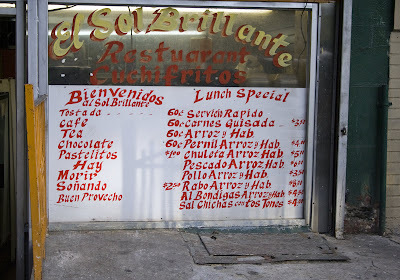 We have now come to Alphabet City, a subset of the East Village. 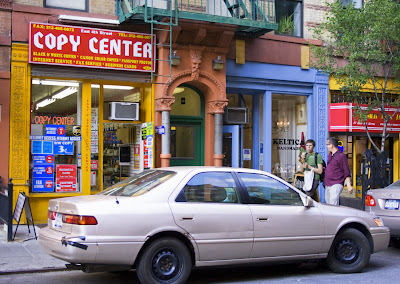 It's obvious why it's called Alphabet City (Avenues A-D), but I have been trying to find out when it got its name, with no success. Anyone out there know? 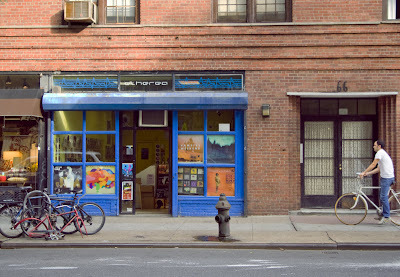 This is Etherea, a small and well-regarded record store. Kind of a mixed message here. 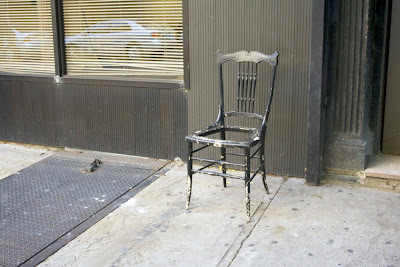 Sit/don't sit. This little doggy's coat says "Adopt Me." And in the window, hard to see because of the scrollwork, are some half grown kitties romping around. So cute. So adoptable. Come on down. No, we didn't take any because I already have two cats, Luka has one, and that's all we can handle. Continuing the cute animal theme, I was just watching Dogtown - did you see those puppies?!! And Toughie?! Talk about totally lovable. 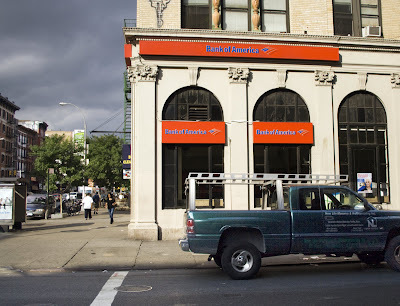 Sometimes you just have to post a photo of a bank. Will you look at that color? I'm putting in a label for color. By that, I mean colorful buildings. Signage doesn't count, being colorful by nature. Okay, label's in, but I'm only through 2006 so far. 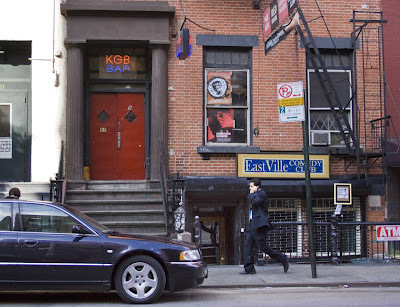 When I took this shot, I had no idea how interesting the KGB Bar would be. You must check out the link. Now I want to go there. And maybe the Comedy Club, too. Strolling along 4th Street, Luka noticed a massage place and suggested we have a foot massage. I used to hesitate at spending money on something so self-indulgent, but since I learned the health benefits of massage, I hesitate no more. Within 30 seconds we were up on tables, having a painfully good foot and leg massage. This photo is from the entryway. 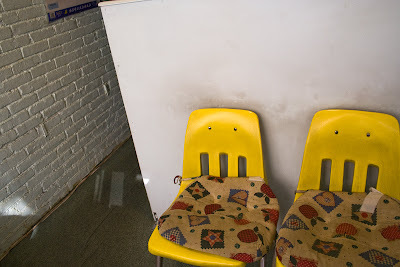 I don't think we noticed how grubby the place was, but then, it was a foot massage, so no matter. 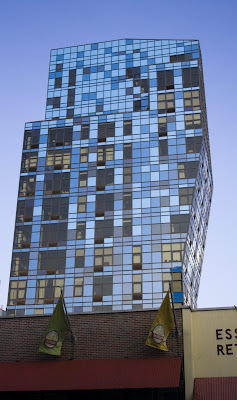 After lunch, we walked across 4th Street into the East Village, and here at Bowery is a new building! Construction! This is a real beauty, I think. 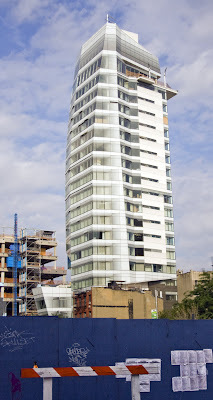 It's the Cooper Square Hotel, set to open any day now. 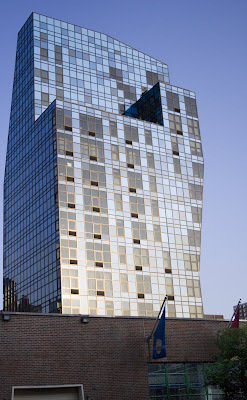 As luck would have it, this week Justin Davidson, New York Magazine's architecture critic, has an article called Glass Stampede, with photographs of 54 new buildings alongside photographs of the buildings they replaced. Our building is number 43 on page 20. He calls it an "elegant building that makes a clumsy intrusion." Check out the site to find out why. First things first and I mean lunch. I had suggested Po earlier, but Luka hesitated, being on a diet. Now, however, after her hike, she saw things differently. She saw that she deserved to eat at Po. It was the first time either of us had been here, although it's been on my mind since it opened in 1993. Well, it is the perfect Village restaurant, small, charming, nice waitress, open windows, on a short side street. About half full for lunch. If only we had loved our food. I had grilled octopus not to my taste because it was sweet. But the menu made clear it came with balsamic reduction so it was my fault. But why would anyone want to make grilled octopus sweet? That was their fault. Luka didn't love her sausage, but I thought it was delicious. I think it's worth a repeat visit. Here's a short New York Magazine review. We arranged to meet at Christopher Park. I went by subway like a normal person. 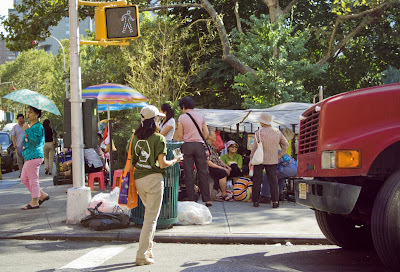 Luka walked from 101st Street to Sheridan Square. Over 93 blocks! This what she did before our walk. 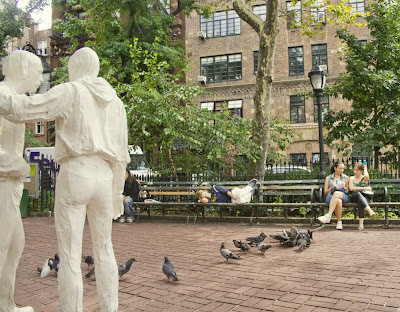 I found her in the park close by Gay Liberation, the sculpture by George Segal, commemorating the Gay Liberation movement which started with the Stonewall Rebellion in 1969. Lots of studying to do tonight. Follow those links! Yesterday, September 11, Luka and I got together as we have almost every year since 2001. In the first few years, we did things closely related to the event itself; we went to the Cathedral of St. John the Divine and heard the names read, we revisited places we'd been to in the weeks after the attack and we talked about our grief and disbelief. But things do change and this year I realized that now when I see something in New York, beautiful or otherwise impressive, I no longer feel sadness and loss thinking about its possible destruction. So now our observance seems to be more about appreciating New York. Making it formal. 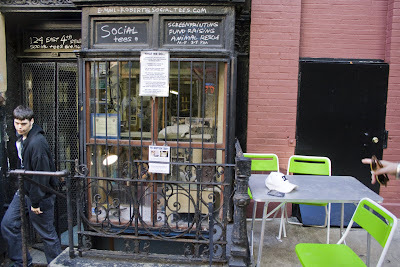 We decided to go to a part of New York I hadn't photographed yet, a new area, let's see, how about the Lower East Side, and also take a look at Luka's first apartment on East 11th when she moved here long, long ago. And of course we would also appreciate New York by having lunch and possibly, dinner. The day was nice, not as nice as 9/11/01, but nice enough, and began with a little bit of slapstick when I heard on TV that there was a bomb scare at Stuyvesant High School. Since I knew Luka was already out of the house, I phoned her to give her the news. Soon after I had to phone her to say, never mind, that was a replay of the coverage on 9/11/01. 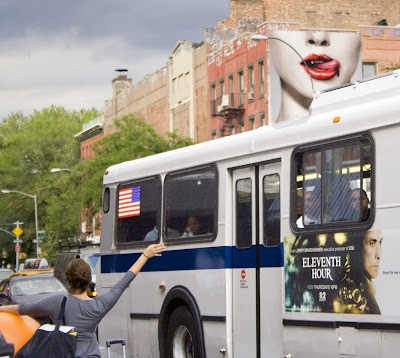 And now, on my way to the subway, how about this? This ambitious mural (it goes around the back of the building) appeared a week or so ago. I wish I'd seen it being made. To see the building pre-decoration go here. 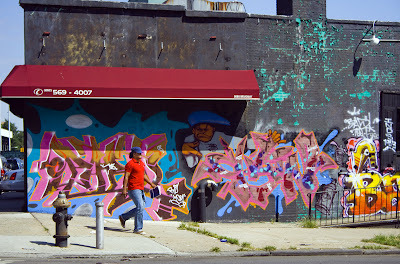 To see more of the mural, go here. After we left Mosco Street, I turned my camera off. I was getting sick from an over-abundance of riches. Like eating too much candy. 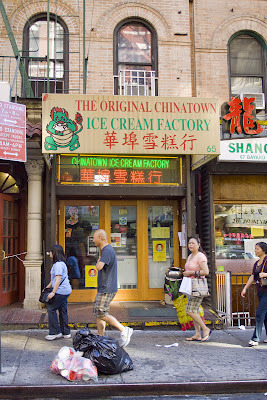 I had to turn it back on, though, to catch this shot of the Ice Cream Factory where we stopped for ice cream cones. We had walked by on a frigid day in February when the line was out the door. Now, on a beautiful warm day, no line at all. Go figure. I had coconut, Bill had ginger. This isn't really top of the line ice cream, but it just feels more right than going to the Hagen Daz store. And the flavors are more right. Okay, that's it for Chinatown. About time. Even though I posted multiple shots, I ran over my two week limit. Sorry! 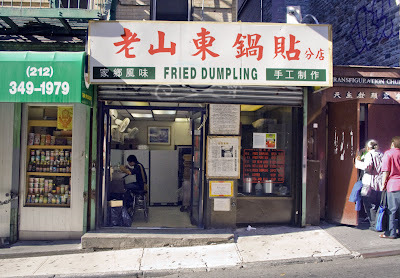 Take note of Fried Dumpling and where it's located. As times get tougher and cash gets scarcer, this is where we're all going to be meeting up. Five dumplings for $1.00. Said to be delicious. Hot and Sour soup $1.00. And then there's soy bean juice for 75¢. Bill, of course, couldn't pass up a plate of dumplings, but the sad thing is, I can't remember what he said about them. I do know he ate em right up. This is the reason I decided to throw some money into this project and buy myself a little recorder. 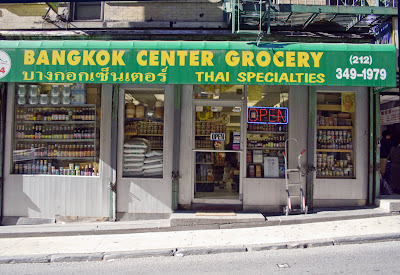 Next door to Fried Dumpling is this Thai grocery store. I looked around and saw a lot of good things and said to myself next time I want to cook authentic Asian, this is the place to come. If I had had a pocket recorder, I would now be able to tell you what some of those great things were. 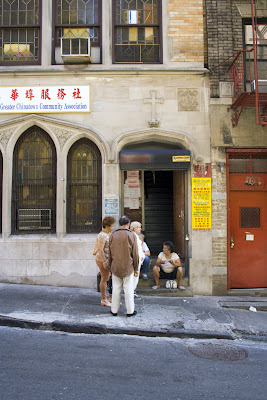 Farther down the block is the Greater Chinatown Community Association. And they say don't shoot into the sun. What's a little flare now and again? 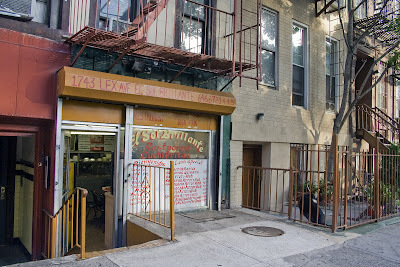 This is Mosco Street, one block long, between Mott and Mulberry. The Street Book doesn't list it and my map (pretty old) calls it Park Street. Aha! 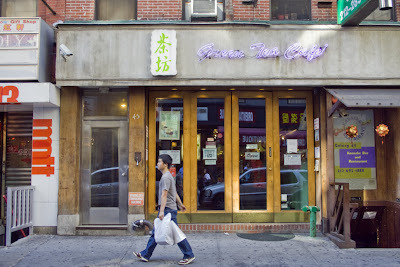 According to Kevin Walsh at forgotten-ny.com, the name was changed from Park Street to Mosco in 1982 in honor of Lower East Side community activist Frank Mosco. 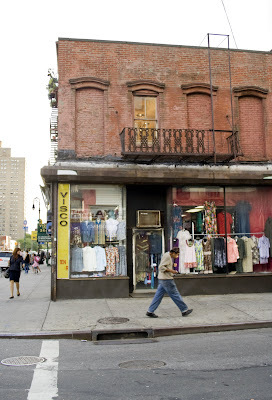 You New York City history buffs need to go to Walsh's website because there's some interesting stuff about Five Points, of which Mosco Street is a vestige, and what used to be where and how far the street used to run before Columbus Park was built, very important things. 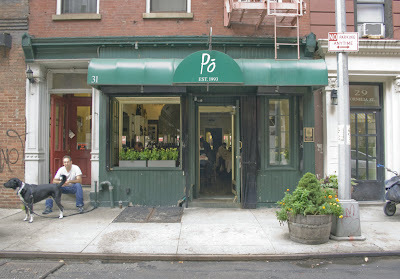 By the way, The Street Book was published in 1978, and sure enough, it does list Park Street. 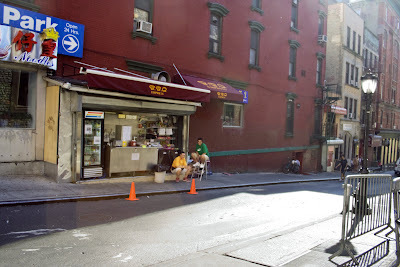 Here are two tea cafés on one little block, both specializing in bubble tea and snacks and sweets. 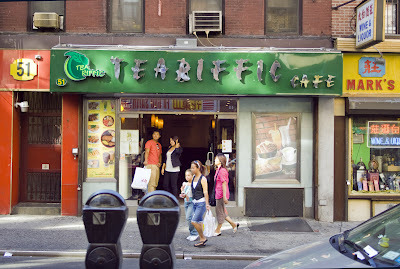 The Teariffic Cafe and the Green Tea Café. More regrets. I've never had bubble tea. Why didn't I . . . ? Well, I had just eaten lunch. Still . . . Bubble tea is a recent phenomenon and I assume these cafés are part of that trend. 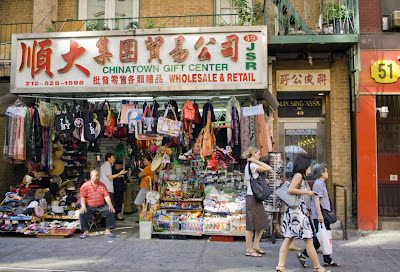 Notice how they don't look or sound like old Chinatown? The photo below will remind you of where you are. Can you believe this color? I dare one of those photorealists to come down here and paint this scene. This is the northern end of Columbus Park which we first saw over a year ago at its southern side. The sign at the entrance says Columbus Park Pavilion. Googling the pavillion brought up some interesting stuff. If you go to NYBeyondSight, you can hear Wellington Chen talking about the area and the pavilion (scroll to the bottom of the page). Or Brian Lehrer describing the Empire State Building. Or . . . but you can check it out for yourself. And then there is Project For Public Spaces, where the pavilion was placed in the Hall of Shame BEFORE it was renovated in 2007. Go there to see photographs of its sorry state pre-2007. And finally, I learned on Yelp that once again I have been a dope, just taking my shot and walking on. Apparently old China exists right down that path. One day when this project is finished, I'm going to start at the beginning of the blog and go back to all those places where I later regretted not going farther. Stick with me. 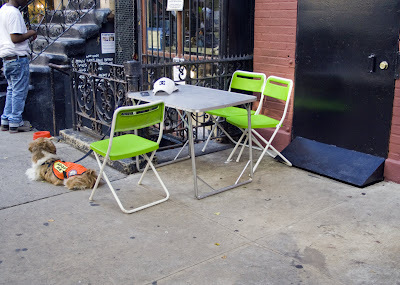 This is at the other end of the block at Mulberry where lots of people hang out outside of the park. I'm happy to be posting this well before midnight now that the conventions are over. That was some two weeks. This block, which has been turned into a pedestrian way, is named both White Street and John J. Clavin Place. Google had nothing to say about Clavin Place or John J. Clavin, and wondered if I meant to say Calvin. 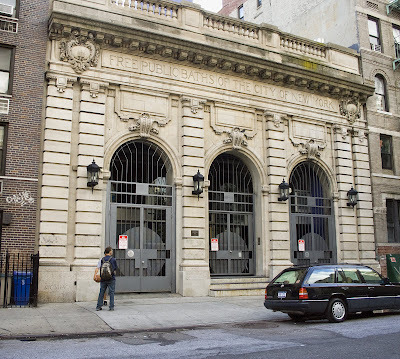 It runs between the two buildings which make up the Manhattan Detention Complex, popularly called The Tombs, and for five years named the Bernard B. Kerik Complex. 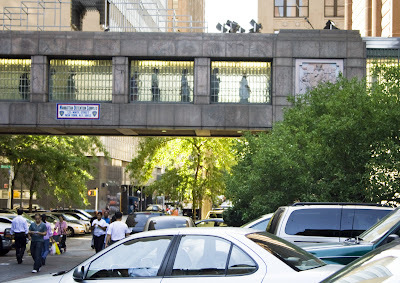 Mayor Bloomberg had Kerik's name stripped from the buildings the day after he pleaded guilty to two misdemeanors involving shady money dealings. 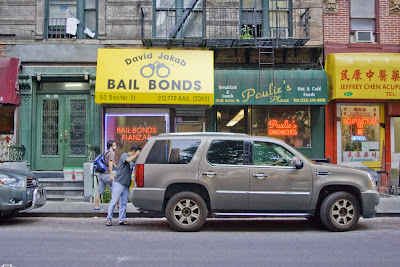 A visitor to the jail was quoted in the New York Times as saying, "No jail needs to be named after a crook." 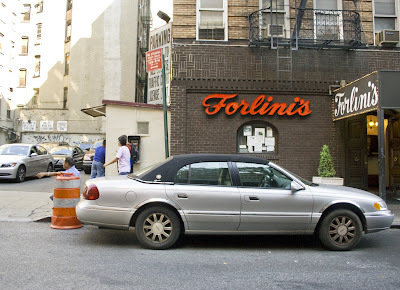 The article goes on to mention other New York places named for bad guys. Connecting the two buildings is the walkway we see in the photo above. Seems to be a lot of traffic. I am standing on Baxter Street looking toward Centre and the late afternoon sun. 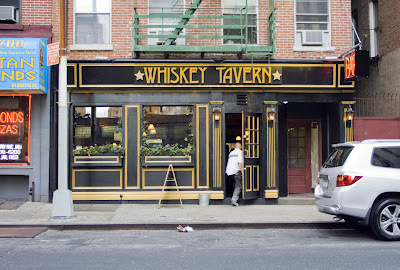 Now we're looking back toward Baxter Street with the Whiskey Tavern dead ahead. 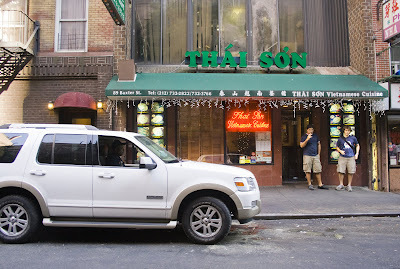 Thai Son is not a Thai restaurant. It's Vietnamese. A sign of the nearby courts. Another sign of the nearby courts? See review.